Aura Heat Vertical Flat Panel Radiator for central heating. 10 Year Guarantee. 30 Day Returns Policy. Style: tall, upright, modern, flat panel tubes / bars, contemporary. Colour: chrome, white, black. Long-lasting with durable finish. 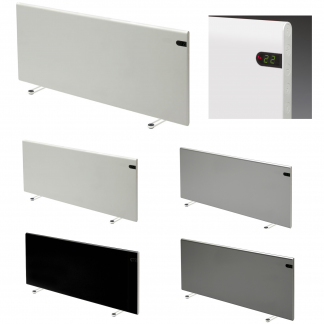 Ideal heater for room spaces such as home, dining room, lounge, kitchen, bathroom, bedroom, office, static caravan. Available sizes: Width: 376mm. Height: 1800mm. Size range: Narrow / Slim, Tall / Large. BTU Output: 3302 BTU’s. Wall-mounted radiator. Wall projection = 100mm to the front face. Easy to install – 4 x wall brackets supplied. Pipe centres = width of radiator. Pipe connections: 1/2 Inch BSP. The Aura Heat is a modern designer vertical radiator for central heating systems. It is an ideal feature for your home and is suitable for lounge, dining room, hallway, bedroom, bathroom, kitchen and conservatory. 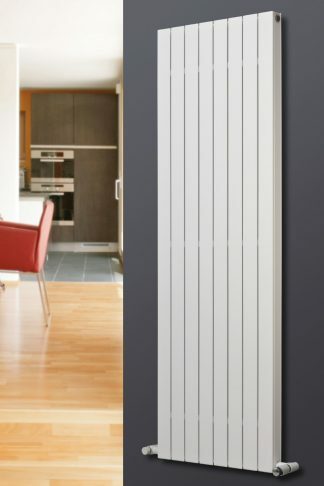 The simple, stylish design is tall and narrow, saving space in a room and allowing for positioning in confined areas. 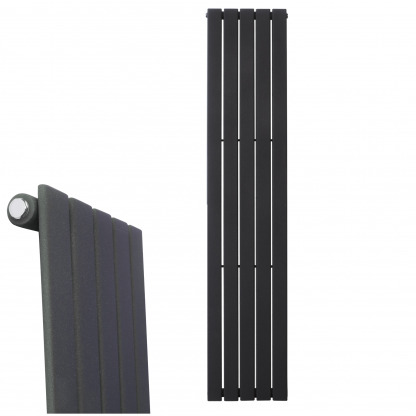 This radiator comes in a single large size, measuring 376 mm width x 1800 mm height. The heat output is 3372 BTU / 988W (the radiators can heat up to 15m2 room space). 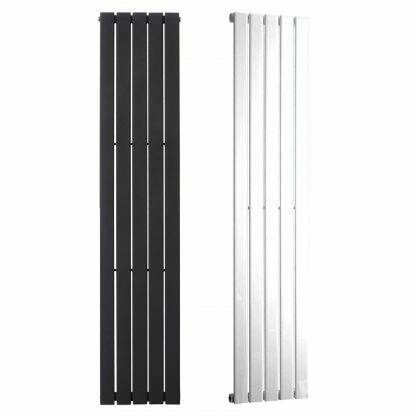 This is a quality designer radiator and has been tested to the highest standards (BS EN 442, ASTM B117). 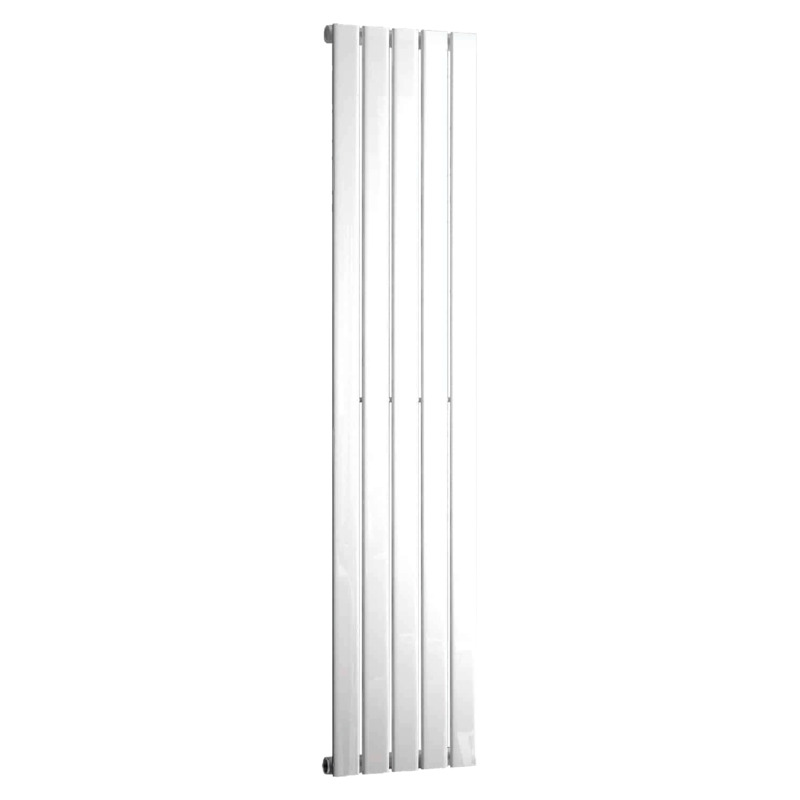 This designer radiator is part of our Elements rage, and offers a superb contemporary look to a modern home. 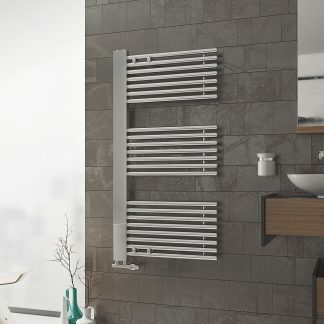 The textured finishes give the designer radiators a unique quality appearance. By choosing a coloured finish, you gain the advantage of an extra 20% heat output, compared to chrome. There is a fine texture in the paint work, with a subtle sparkle ingrained in the paint. Choose between 2 high quality finishes: Lava Grey (Anthracite) or Ice White. Lava Grey is a Black / Anthracite mixture, with a slight glitter effect when in sunlight. Ice white has a hint of Blue / Silver to add a modern edge onto the classic white, which sparkles in light. 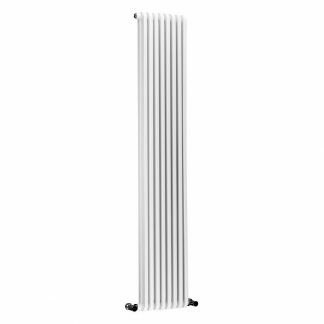 Top quality rapid-heating Aluminium Vertical Designer Radiator for gas central heating systems. Style / Type: Tall, upright, modern. 5 x flat-panel bars. High Heat Output: 3302 BTU / 988W (Can heat up to 12.5m2 depending on standard of room insulation). Economic, efficient, long-lasting with durable finish. The radiator comes with a fixing kit, including: Instructions, Wall brackets, blanking plug and air vent plug. Wall-mounted. Wall projection = Slimline – 100mm to the front face. Easy to install – supplied with 4 x easy-fix wall brackets. Bleed valves and blank plugs included. Pipe connections: 1/2″ or 1/2 Inch BSP. Solaire Quartz also sell Radiator Valves in our Accessories section. You can choose from manual or thermostatic versions, to suit your heating requirements. Tested to the highest standards (BS EN 442, ASTM B117), the superior quality of our radiators allows us to back them with lengthy guarantees. Work out your room heating requirement in BTU’s or Watts here.